Hon’ble President and the Supreme Commander of the armed forces of India, Shri Pranab Mukherjee, reviewed the Fleet comprising naval warships from Indian as well as frontline foreign navies this morning (06 Feb 16). This was the eleventh Fleet Review after Independence and the second with participation of foreign navies. After a 21-Gun salute and ceremonial Guard of Honour, the President embarked INS Sumitra, an indigenously built Naval Offshore Patrol Vessel (NOPV) designated as the ‘Presidential Yacht’. 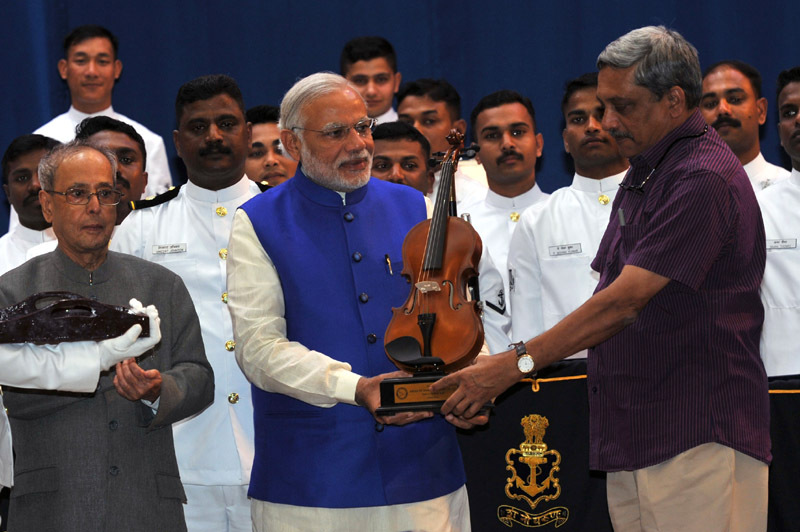 The President was received by the Hon’ble Prime Minister Shri Narendra Modi, Hon’ble Raksha Mantri Shri Manohar Parrikar and Admiral RK Dhowan, Chief of the Naval Staff. On leaving harbor, the President’s Yacht weaved through the 70 ships at anchorage off Visakhapatnam port. A spectacular fly-past was conducted as a part of the static review of the Fleet. During the final stage of the review, a mobile column of warships and submarines carried out high speed steam past alongside the Presidential yacht. Addressing the Fleet during the Review, the Hon’ble President said that IFR 2016, while showcasing the prowess of the Indian Navy, has brought together navies from across the globe here on Indian shores, signifying our common desire to use the seas to promote peace, cooperation and friendship, as also to develop partnerships for a secure maritime future ( full transcript of the address by the Hon’ble President during the review is attached). In addition to 65 Indian Naval warships and three IN Submarines, the Review also included 24 foreign ships, two ships from the Indian Coast Guard and three from Mercantile Marine. Several enthralling waterfront activities by sail boats, water skiing, display by Marine Commandos and helicopter demonstrations held the public mesmerised. As the presidential yacht passed between the review anchor columns, each ship dressed in full regalia, saluted the President. Each ship was manned by her ship’s company, dressed in white ceremonial uniform. In a moment that stood still in time, white caps were doffed in unison in a grand salutation. The resounding sound of ‘Three Jais’ by the ships’ crew echoed over the waves symbolising the spirit of camaraderie and bonhomie across the seas. Along the way, the Hon’ble President also witnessed demonstrations in the form of breathtaking fly-past by Naval Air Arm and a daring display by the elite Marine Commandos. The fly-past comprised 15 formations of 45 aircraft including two formations from the Indian Coast Guard. It also showcased the latest acquisitions of the Indian Navy such as MiG 29K, Long Range MR aircraft P8I and AEW helicopter KM-31. • Subedar Nagesha TT r/o vill Tejur, Hassan Dist, Karnataka. • Havildar Elumalai M r/o vill Dukkam Parai, Vellore Dist, Tamil Nadu. • Lance Havildar S Kumar r/o vill Kumanan Thozhu, Teni Dist, Tamil Nadu. • Lance Naik Sudheesh B r/o vill Monroethuruth, Kollam Dist, Kerala. • Lance Naik Hanamanthappa Koppad r/o vill Betadur, Dharwad Dist, Karnataka. • Sepoy Mahesha PN r/o vill HD Kote, Mysore Dist, Karnataka. • Sepoy Ganesan G r/o village Chokkathevan Patti, Madurai Dist, Tamil Nadu. • Sepoy Rama Moorthy N r/o vill Gudisatana Palli , Krishna Giri Dist, Tamil Nadu. • Sep Mustaq Ahmed S r/o vill Parnapalle, Kurnool Dist, Andhra Pradesh.